And we are off to Virginia for almost two weeks. The show in Yellow Springs was great! It rained cats and dogs Friday night and left a big muddy mess on Saturday morning but we knitters aren’t gonna let that stop us. Both days turned off sunny and cooler which was just perfect. So now on to Shenandoah Valley Fiber Festival and Fall Fiber Festival. We don’t have definite plans for the four days we have between yet. 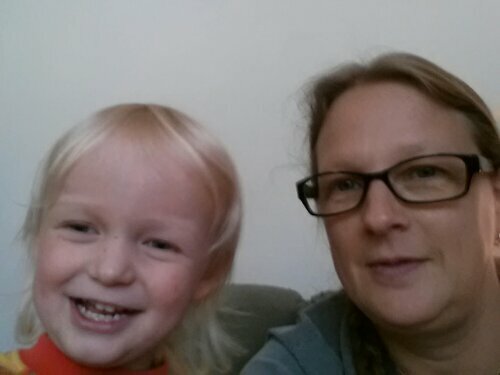 Parting shot of Elijah and me this morning just for fun. 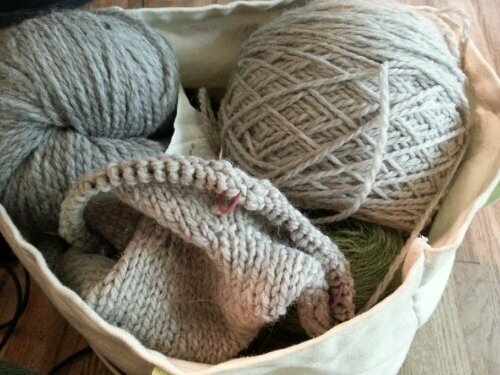 I ran out of yarn once. It was just a weekend visit, with another knitter no less, and I finished up the only project I had brought with me. That’s a rookie mistake. The funny part is that I am pretty sure it would be impossible to run out of yarn. :-) Thanks to my ereading devices I have no fear of running out of reading material either. Love that. Well yes, YOU probably wouldn’t run out of yarn. (Note to self: look into getting trailer to haul yarn stash everywhere) Ha! Even if you weren’t a yarn vendor yourself, running out of yarn at a fiber show would take a special kind of talent. ;) Hope you have beautiful weather and fantastic sales!